People change their futon covers all the time. Having a great selection of covers handy will make an impact on your guests. They won’t get tired of your room decor and will be happy to see a refreshing new look. The futon is more popular than ever and rightfully so given the ease and practicality it offers. 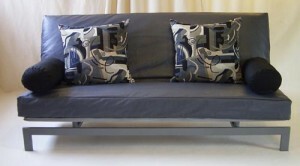 With so many futon cover designs available, you wouldn’t run out of options in changing out the look. Covers are relatively inexpensive compared to having to buy new furniture. They also protect your mattress too, and prevent rips and tears from happening to your futon mattress. It’s easy to find a cover that’s right for you. Covers come in all price rages. There are your basic solid color twill futon covers which are pretty cheap. There’s also contemporary designs, textured, leather look, novelty prints, velvets, and microfiber covers to name a few. It all comes down to your own personal preference on which to go with. Don’t be afraid to try out different covers for your room. Switch them up during every season for a whole new look. Enjoy all of the different possibilities futon covers offer. You can find quite a good selection of name brand futon covers online. « Shopping for a Futon Frame?